Spring has arrived in Hendricks County and running and walking is the perfect way to enjoy it and stay in shape at the same time. Many paved and wooded nature trails are located throughout the county. This post is dedicated to the most popular ones. No matter which area of Hendricks County you live in or visit, you can always find a park and trail to explore and enjoy all the beauty of spring. I finally discovered Ellis Park, 600 E. Main St., and Blanton Woods a few weeks ago and cannot believe I&apos;ve never visited this gem of a park. 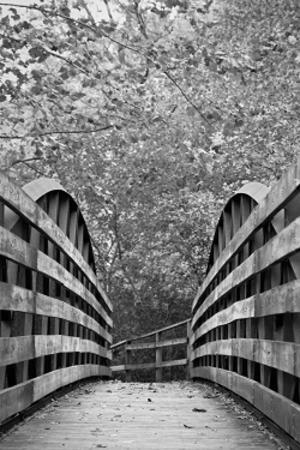 A pedestrian bridge over White Lick Creek connects the park to the woods. The park offers a 3/4-mile paved trail around the perimeter. Blanton Woods is comprised of both forest and open meadows and two miles of hiking trails. Click here for maps and parking information. I visited mid-week in the morning and ran on the paved trail as well as the wooded nature trail. During busier times, I would recommend hiking as opposed to running because the nature trails are narrow in spots. This makes it difficult to maneuver around people and dogs. If the family is in tow, the trails are suitable for children. In fact, I&apos;m sure they would love to explore these natural surroundings. Ellis Park offers three playgrounds (the most popular is Playscape) and the Gill Family Aquatic Center, an outdoor waterpark. Part of the Vandalia Rail Trail System extends three miles from Amo to Coatesville. Hikers, bikers and equestrians all use this trail. The equestrian trail runs along side the hiker/biker trail with only a few intersecting areas. This is not a difficult trail but, due to the packed stone and natural surfaces, I would suggest wearing a sturdy pair of hiking shoes or boots. I hiked this trail on one of the first warm, sunny mornings this spring. The trees, creeks and plants are beautiful this time of year. You can also see fields and prairies in the distance that make for interesting views. Parking in Amo is located at the Railroad and Vine streets intersection. In Coatesville, lots are located south of Railroad Street and just east of Milton Street. It is important to note that no public restrooms are available along the trail. Click here for maps, parking info and restroom options. The Vandalia Rail Trail, White Lick Creek Trail and Guilford Township&apos;s Hummel Park trails all interconnect. Click here for a detailed map. All the trails are paved, so they&apos;re ideal for walking, running, cycling and skating. Vandalia Rail Trail and White Lick Creek Trail meet at Franklin Park, 300 N. Mill St. The Vandalia Rail Trail is 4.5 miles and runs from Martin Road to Perry Road. Parking is available at the Richard A. Carlucci Recreation and Aquatic Center, 651 Vestal Road, and Franklin Park. Going east from Franklin Park, you will pass by older neighborhoods, the Bob Ward Park, wooded areas and open spaces. If you head west from the park, you will see newer residential subdivisions, wooded areas and the recreation and aquatic center. Click here for a map. White Lick Creek Trail runs south to Hummel Park and is 3.3 miles. Along this trail, you will see Friendship Gardens. This scenic area boasts a historic iron truss bridge, a small waterfall area, gazebosand attractive, colorful gardens. As you continue to Hummel Park, you will pass Swinford and Anderson Skate parks. Hendricks County residents love Hummel Park, 1500 S. Center St. Kids enjoy the playgrounds and splash pad. Families can explore the areas and paths surrounding White Lick Creek. Two paths cover 2.5 miles, Cottonwood (.5 miles ) and Blue Heron (2 miles). Check out a previous post for a more detailed description. 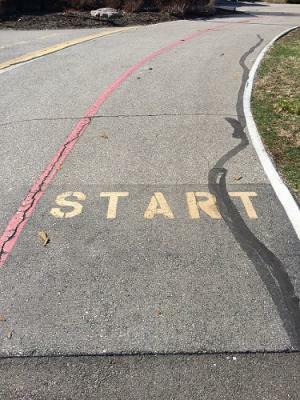 If you want to add another mile to your run/walk, a 1.1-mile track surrounds the perimeter of the park. Since all the trails are connected, it&apos;s perfect for training for longer distances! It&apos;s also a great way to see some of what Plainfield has to offer. Avon Town Hall Park Trail, west of the Ind. 267 and U.S. 36 intersections, offers 1.5 miles of paved trails. This is ideal for shorter runs/walks. If you want to increase your mileage, you can gain about three miles by running through surrounding neighborhoods. This trail never gets dull because there is so much to see on the run including people fishing, playing disc golf, flying a kite and sometimes even flying remote-controlled airplanes! A 9-acre fishing lake, bridges, an old horse farm and Avon Town Hall add to the ambiance of the park. Click here for more information. If you are looking for hiking trails in Avon, visit Avon-Washington Township Park, 115 S. County Road 575 East. Plenty of options abound depending on your skill level. This park offers 12 trails, all under 1 mile. Level of difficulty ranges from easy (Bluebird, Cardinal, Oriole) to difficult (Tulip, Poplar Pass). Click here for a map. Other amenities include, biking trails, outdoor fitness station, basketball courts, playgrounds and a splash pad. McCloud Nature Park, 8518 Hughes Road, offers 12 different trails of varying lengths (.13 to 1.1 miles) equalling 6.5 miles of hiking trails. 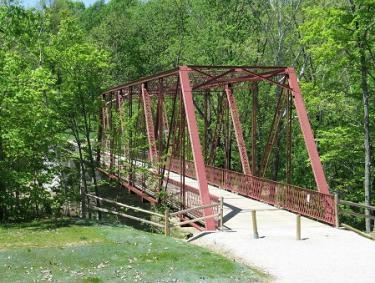 Red-tailed Ridge is the longest and provides spectacular views of the historic iron truss bridge over Big Walnut Creek. Wooded areas, prairies and open lawns surround the trails, which are conducive to running. Click here for a map. McCloud Nature Park even hosts the Fall Colors Run in October, which is the perfect opportunity to view the fall foliage. But this park is truly amazing all-year round. 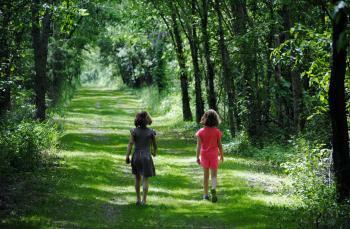 Williams Park, 940 S. Locust Lane, offers paved and nature trails. The paved trail is a .78-mile loop around the perimeter of the park. It is ideal for shorter distances and alternating between running and walking. A few notable sites in the park include the Veterans Memorial Garden and the Gazebo Pavilion. It is also home to the popular "Blast Off" playground and "Watermill" splash playground. Prefer a nature hike or trail run? Maple Ridge Nature Trail is .79 miles but you can add more mileage by checking out several secondary trails along White Lick Creek. As you can see, Hendricks County offers plenty of options for enjoying the springtime weather and scenery while getting some exercise and staying healthy!